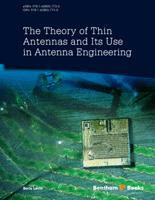 B. Levin’s eBook “The Theory of Thin antennas and Its Use in Antenna Engineering” is dedicated to the theory of thin perfectly conducting and impedance radiators. For the most part, it bases on original results of the author who has successfully been tackling the problems of thin antennas for about fifty years and has contributed hundred published papers and fifty inventions in this area of great interest. Particularly impressive is that the author succeeds in an eBook so small in volume (~ 200 pages), in treating at a high scientific level the most important aspects of the analysis and synthesis of thin radiators and probable fields of their application. In the manner of rendering the material and in the number of thin antenna variants considered by the author, the eBook comes close to a handbook, which makes the results set forth in it much easier to use. Undoubtedly B. Levin’s eBook will be greeted with interest by the community of antenna professionals and students of higher radio engineering schools. The eBook deals with the methods of theoretical and experimental research of antennas, which are based on the electromagnetic (EM) theory. The theory of thin antennas underlies the antenna analysis, as they represent one of the main types of radiators and are extensively put into practice both as independent antennas and as elements of more complicated antennas. Here, techniques for calculations of the electrical characteristics of thin linear antennas are described and analyzed consistently, in particular, the methods of Poynting vector and the induced electromotive force (emf) (first and second formulations) as well as the integral equation method for the antenna conductor current. The theorem of the oscillating power is shown to allow bringing the difficult answers of the antenna theory to light. The eBook presents several new methods of antenna analysis and design, including the theory of electrically coupled lines, and the methods of complex potential, of the compensation, of the impedance line, and of the mathematical programming among others. New results are obtained. The complex potential method is generalized to inhomogeneous media and is employed in conical and parabolic problems. The theory of electrically coupled lines allows considering theoretical problems of multi-conductor cables and multi-radiator antennas. The compensation method permits creating a weak field area in the near region of a transmitting antenna. The method of impedance line is applied to antennas with loads, and the method of mathematical programming offers selecting loads to develop antennas with required characteristics. It is shown how the methods of dipoles and monopoles calculation are generalized to the more complicated structures: an antenna with displaced feed point, with losses in the wire, with the lumped and distributed loads, multi-wires, multi-radiators, folded and multi-folded antennas, and antennas of parallel wires with different length. The duality principle provides the slot antenna analysis. The methods described enable calculating designs of new types of antennas, particularly, the self-complementary ones. A self-complementary structure exhibits constant and purely resistive input impedance in a wide frequency range. In the general case, similar properties pertain to the three-dimensional self-complementary antennas, their variants being considered in the eBook. Different types of arrays including reflect and adaptive arrays are treated in the eBook in detail. The reciprocity theorem for a reflect array permits to determine a field phase step in a signal reradiated by a reflect array element and to build a reflect array with any given radiation direction. Close attention is paid to the field compensation in the near region of a transmitting antenna and to creation of the dark spot. The shape and dimensions of dark spots and the irradiation reduction factor are found. Also, a compensation method seeking to form a weak field area over a broad frequency band is considered. Broadband field compensation is shown to be achievable in various structures where the required anti-phase second field is established either by an auxiliary antenna of identical type or by radiators located at equal distances from the compensation point, or by flat reflectors. The characteristics of metal-shielded two-wire lines (twisted pairs) are calculated using a rigorous method based on the theory of electrically coupled lines. The cross-coupling between lines in multi-conductor cables is shown to result in a kind of electromagnetic interference (crosstalk) in communication channels, while the asymmetry of excitation and loads is shown to result in appearance of common mode currents in the cable. Voltage values (interference) for loads placed at the beginning and the end of the adjacent line are found at a given power in the main line. The effect of loads connected between wires and shield is examined. A modified method for solving integral equations, which permits to obtain an integral expression for the current at each point of antenna, is proposed. The distribution law for the current along a radiator with distributed and concentrated (lumped) loads is analyzed. The distribution is shown to be similar to that along an equivalent long line (an impedance line). Linear and V-antennas with lumped capacitive loads are described. The problem of load selection to develop antennas with optimal characteristics is considered. Special attention is devoted to the synthesis of wide-band loaded antennas as well as to the issues of producing a given current distribution along a dipole and to those of reducing the effects of re-radiators. In addition, some other matters are discussed in the eBook: transparent antennas, the rectangular loop field, structural features of ship borne (onboard) antennas. For example, creating a uniform distribution of currents along the transparent radiator cross-section by means of a metal triangle is shown to allow obtaining a sufficiently efficient antenna, its undeniable advantage being wide frequency band. The azimuth and radial field components of a rectangular loop in far and near field are found. Loop dimensions and shape are demonstrated to have a substantial effect on the field magnitude, especially in the near region. The proposed eBook is a natural addition to known monographs. It is intended for professionals, who are engaged in engineering electrodynamics and in development, deployment and operation of antennas. To benefit from it will also be lecturers (university-level professors), teachers, students, advisors, etc. in their profound study of fields radiated by antenna equipment. The contents of the eBook can be drawn on to a short university course. I want to express my deep gratitude my teachers - for the transferred to me knowledge of electromagnetic theory and principles of antenna engineering, employees at work - for his help in the calculations and experiments, my wife – for understanding. The author(s) confirm that this eBook content has no conflict of interest.